The Carmen’s Caterer (or Service with a Smile). 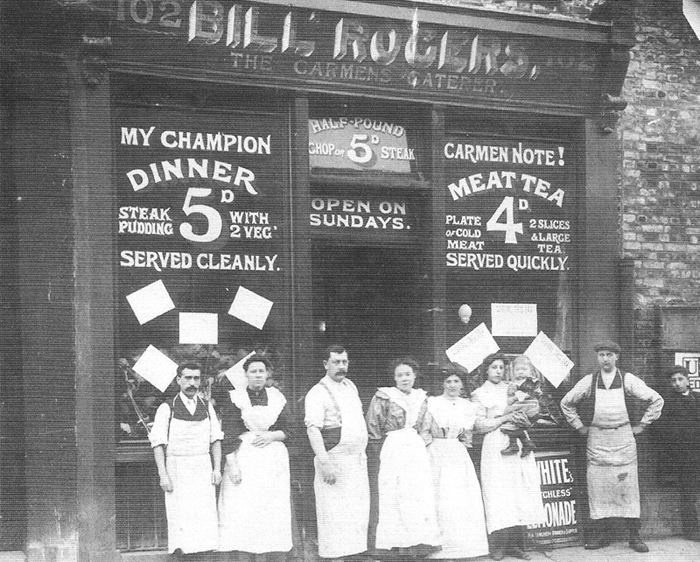 In 1906, at 102 Whitechapel Road, Bill Rogers’ Dining Rooms for Carmen could be found. This establishment is ideal for transposition to Artillery Lane with all the goods depots nearby. Carmen were delivery drivers – the White Van Man of the period, and London’s roads were jammed packed with their horse-drawn, carts, wagons and vans. Nothing changes. Rogers’ rooms appear to have aimed a little above the usual (eel) pie & mash shop, instead proudly serving plates of cold meat, chops, steak or steak and kidney pud with two veg, and not forgetting the essential large tea…and I’ll bet there weren’t any slugs in the lettuce either. I was intrigued by the R Whites Lemonade board – Google surprised me by revealing the drink was first produced in 1845. We’re firmly in Basilica Fields territory here; St. Mary’s station was opened by the East London Railway, and was also used by District Line trains, and is next door but one to the right. The station received a direct hit from a bomb in 1940, destroying it completely, and severely damaging the Rivoli cinema next door, and number 102 can be seen at the far right of the image. Remarkably 102 still stands, now an Islamic book & media shop sandwiched between the Citroen garage and Alvin Lee. Oops, I missed this class out from the first block of locos. The 921s were Stirling’s final saddle tank design, and they first entered traffic at the end of 1892. Initially the class was intended to deal with the increasing goods and mineral traffic over the Widened Lines to and from the London, Chatham & Dover Railway over the Thames via Ludgate Hill and Blackfriars, and thus the first six (and later a floating total of approximately 25) of the domeless locos were fitted with condensing gear. Their success ensured the class multiplied to 52 in 1897, by which time they could be found on goods and shunting duties across the system. The class will be active on EWL goods and mineral duties through Artillery Lane from and to both Kings Cross and Ludgate Hill to the docks and New Cross via Basilica Fields. 922, the second member of the class to be built is seen here in the late 1890s, with the evidence of cross-London transfer workings all around in the form of LC&DR wagons and tarpaulins. The heavily weathered and stained paintwork once again lends credence to the argument that not all was sparkly and bright in the Victorian pre-Grouping period. By the time Patrick Stirling was appointed Locomotive Superintendent of the GNR in 1867, the second series of his predecessor’s twenty outside-framed 0-4-2 Back Tanks were just being delivered, but it was already clear that alone they were unable to cope with the sheer volume of the fast-growing suburban traffic. Stirling therefore produced a revised version of Sturrock’s 241 and 270 classes by designing an 0-4-2 Well Tank with inside frames for the leading coupled wheels, which were classified the 126 class. Thirteen examples were built by Doncaster between 1868 – 1871, and they began to displace some of the earlier classes from Widened Lines duties, although those affected initially only went as far as Hatfield, with some remaining at Kings Cross. Between 1884 and 1889, 4′ 2½” straightback boilers replaced the original 4′ 0½” ones, and like the 120 class, five locos gained Ivatt’s 4′ 5″ domed boilers between 1899 and 1907. The introduction of Ivatt’s Atlantic C2 tank in 1897 saw the gradual displacement of the class to more rustic climes, although members of the class hung on tenaciously to Widened Lines duties until as late as 1904, and withdrawal commenced the following year. Between 1903 and 1905, all members of the class were placed on the duplicate list to leave their numbers free for Ivatt’s new 0-8-2T, 1905 also being the year of the first of the classes withdrawals. Of course, as with many of the Widened Lines locomotives, the trade is unsurprisingly silent, so I will be scratchbuilding an example of the class. Number 121, seen here c1904 carries the 4′ 2½” straightback boiler, and has had its original wooden brakes replaced by more modern iron ones.The splasher cutouts have been plated over, and coal rails added to the bunker, though I’m at a loss to describe the function of the bracket on the smokebox. With the current dearth of info on the GN 4-wheeled suburban stock, this post brings to an end the introduction to the four main companies which will be present on Basilica Fields in the first phase of building, and in the earlier period of 1890 – 1897/8. There are two or three directions the blog could take from the next post onwards – the later period on 1897/8 – 1906/7, I could introduce the wider concept of the line and bring in the other companies vying for a slice of the cake, or move on to matters up on the viaduct with the Great Eastern. Kirtley’s 690 class has already been touched upon by way of my post on the closely related 780 class. These six locomotives were delivered in 1869 from Messrs Beyer Peacock specifically for the coal traffic via the Widened Lines to Herne Hill and Battersea which commenced on 17 November 1868 (in fact, the tender for the locos was accepted the following day). The route taken involved the 1:38 incline from Farringdon to Blackfriars which imposed a severe weight limitation on the trains, and the class performed very well on these duties, which then expanded to also include goods trains. Initially fitted with hand brakes to wooden blocks, the 690 class were given steam brakes in 1878 which clearly defined their goods only role, as the 780 class were fitted with Smith’s simple vacuum for passenger duties later that year. 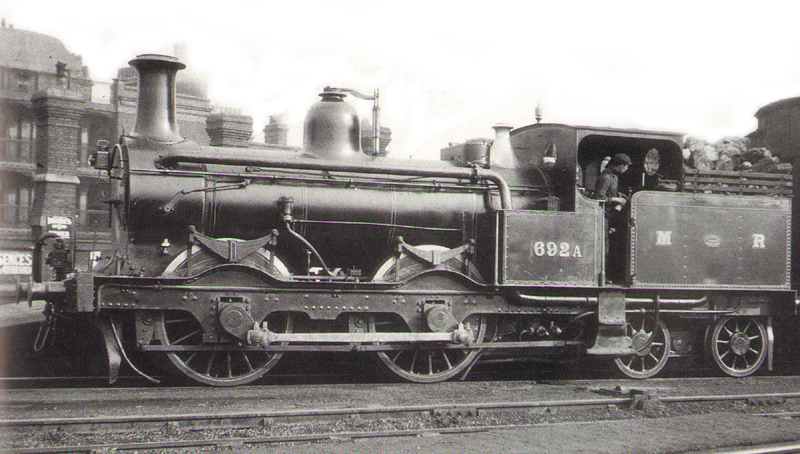 In 1882, the 690 class were also fitted with Sanders automatic brake which continued to segregate them from the 780 class, as they were unable to operate the Smith’s brakes on the Midland’s carriages, and it wasn’t until 1888 that the superior automatic brake was finally fitted to the 780 class, enabling the 690 class (at least on paper) to finally work passenger duties. The 690 class continued to work on Widened Lines goods and coal duties until the introduction of the 2441 class in 1899. Aesthetically, the 690 class went through many changes up to the Basilica Fields period, and 692 is seen here post-1898 on the duplicate list. At this time, some members of the class had the position of the numbers and maker’s plates transposed. Cabs were been fitted between 1888 and 1893 when the Kirtley boilers were scrapped and Johnson’s C Class boilers fitted, which resulted in an immediate visual difference between the 690 and 780 classes in the route taken by the condensing pipes from the smokebox. Up to rebuilding, members of the class were probably still in the green livery, but once in crimson lake, the fully decorated ‘Kentish Town’ lining style appears not to have been applied to the 690 class, and although above the footplate they were fully lined, it would seem only the outside cranks and wheels were so treated below. Stirling’s 120 Class of 0-4-4BTs (back tanks) were designed to improve the rough bunker-first running experienced on both his and Sturrock’s earlier 0-4-2Ts. 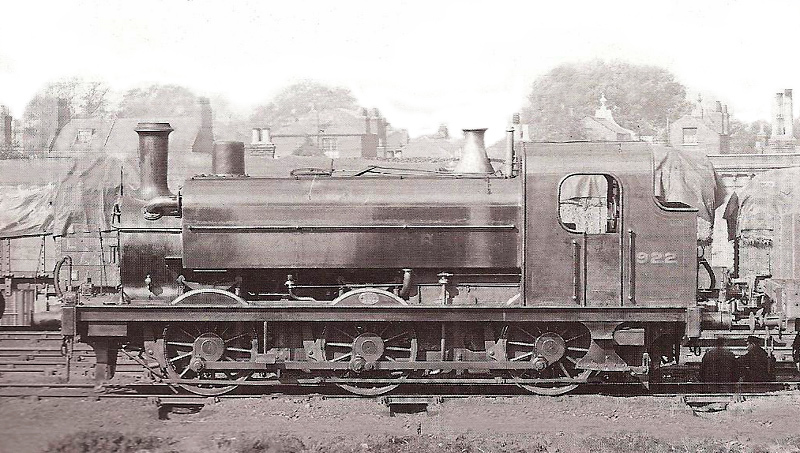 The Midland had already introduced successful 0-4-4T designs for Widened Lines duties in Kirtley’s 690 and 780 classes, and the 120 Class were in many respects a bogie version of his 126 Class 0-4-2WT, however, the 120s had a 1000 gallon tank located in the bunker (as the bogie precluded the use of a well tank) and there was still room for 2½ tons of coal on top. Forty two members of the class were built in small batches between 1872 and 1881, and over the years twenty six of the class were fitted with condensing apparatus to work on the Widened Lines. From 1886, all bar two of the class had their 4′ 2½” boilers replaced by 4′ 5″ straightbacks, and five locos eventually gained domed Ivatt boilers in the early years of the 20th century. During their lifetime many members of the class had modifications to their wrap-over cabs in an attempt to give the crews more protection, and the five which received domed boilers were also fitted with Stirling’s enclosed cabs wrapped laterally. 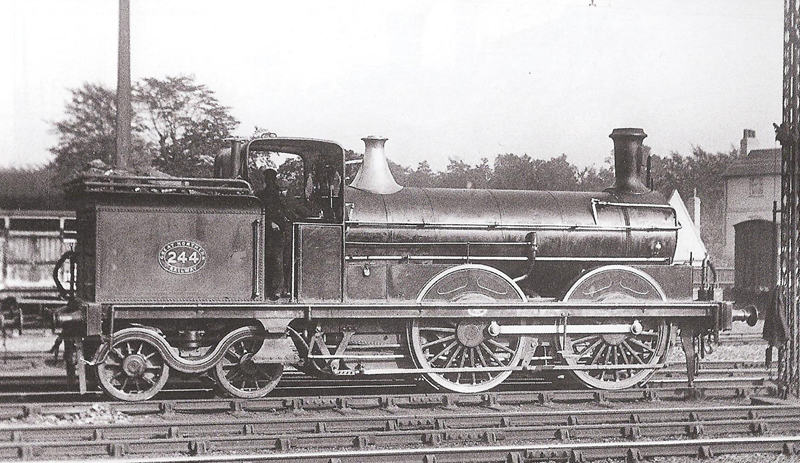 In the photo above, number 244 of 1878 is seen at Hatfield in 1902. She had received the 4′ 5″ straightback boiler in 1891, her splasher cutouts were plated over around this time, and she was to last in service for another eleven years. The tank condensing vent pipe can just be seen in the bunker hard up against the rear of the wrap over roof, on the side nearest the camera. Not much chance of a kit appearing for this loco, so I’m looking for a drawing which will aid in scratchbuilding her – any help much appreciated. Of the four main players on the Metropolitan & Widened Lines, the Great Northern had the greater selection of condensing locomotive classes to call upon over the years. 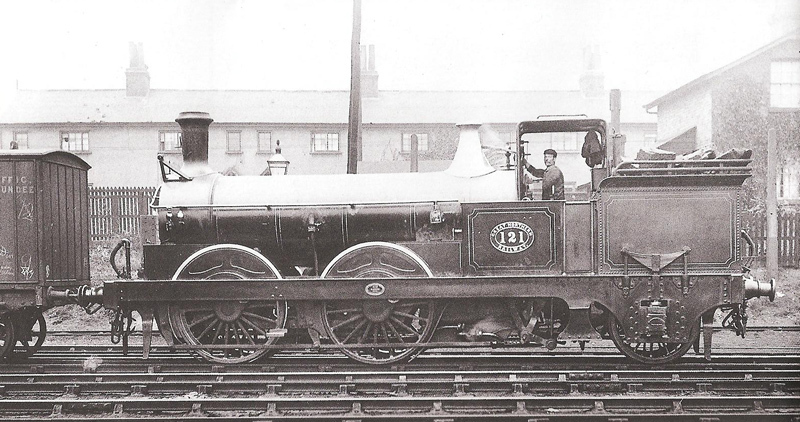 Prior to the introduction of Ivatt’s C2 Atlantic tank in 1898, the most recent introduction was Stirling’s 941 class of 0-4-4Ts, a lighter version of the 766 class (a class which they are often considered a part of) comprising of four locos with shortened side tanks, a rearranged cab, and an enlarged bunker with back tank. These alterations enabled them to be used on the LCDR portion of the Widened Lines west of Moorgate Street to Victoria via Ludgate Hill, a route from which the 766 class proper were banned due to their high axle loading. Therefore, these specific duties of the 941 class preclude them from appearing on the Basilica Fields project, despite being ‘Widened Lines locomotives’ of the period. Not so with the main body of the 766 class – all twenty five were built in three series between 1889 and 1893. 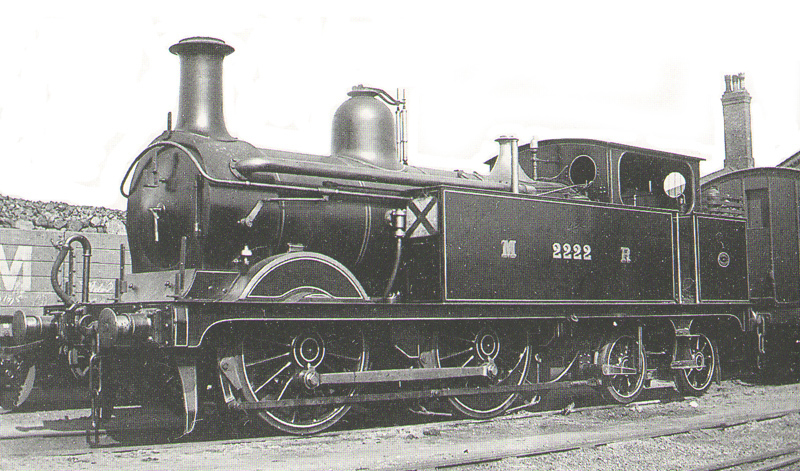 These locos were fitted with Stirling’s 4′ 2.½” straightback (domeless) boiler, and all were fitted with condensing apparatus for working the Widened Lines. 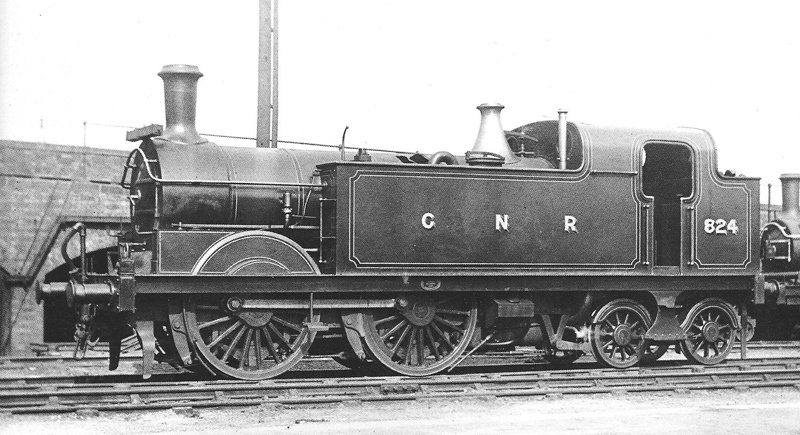 The first two series followed previous GNR convention and had the condensing pipes running between the frames, but the final series had a revised arrangement with them exhausting from the top of the smokebox sides into the tanks, a style which became standard for succeeding designs. The 766 class proved to be very successful on Widened Lines duties, the majority of the class surviving the introduction of the C2s, and were not displaced from London until the advent of Ivatt’s powerful N1 0-6-2Ts on Widened Lines services in 1912. A decision on whether to model one of the earlier series or the final series was something I put off for some time. The early locos had nice clean lines, but the final batch with their big chunky pipework looked like proper condensing locos. I’ve chosen number 824 from the first batch of ten, and she can be seen above at Hornsey in 1904, well looked after by her crew, but bearing the tell-tale signs of hard work in the sulphuric tunnels. The little U bend pipe and tall vents on the tank top betrays the condensing apparatus, and the revolving destination indicator on the top lamp bracket is an interesting contraption – I must find out if it superseded, or was superseded by the more familiar brackets and boards, or if the two types were used concurrently. Of course there are no kits for such a locomotive as this on the market, so it’s going to be an exercise in scratchbuilding. However, the dearth of a drawing here means that unless I’m able to locate one soon, the building of this loco will be held in abeyance. As mentioned previously, S.W. Johnson’s 0-4-4Ts looked after much of the Midland Railway’s passenger, goods and coal services on the Widened Lines during the 1890s. Johnson built 205 0-4-4T locos for the Midland over a period of 25 years between 1875 and 1900, all to a design based upon his 134 class built during his time at Stratford as Locomotive Superintendent of the Great Eastern Railway. Although superficially the design remained constant throughout the 25 year building period, there were of course many minor changes and improvements over the years which resulted in several distinct (and indistinct!) classes. To model 2222 I have a Slater’s kit for the 1252 class as a basis, and will need to make several alterations during the build, not least the size of splashers, as there was a reduction in wheel diameter between the two classes, as well as a change in the wheelbase itself. Number 2222, delivered in September 1893, is seen at Cricklewood, just short of it’s 10th birthday in June 1903, looking resplendent in the fully decorated London livery where just about everything panel and fitting was lined both inside and out. Blimey.